John Welles and his two best friends, Sam Feldman and Claude Willoughby, formed a strong bond during their two years of pre-med studies at the University of Maryland. As they faced the upcoming challenge of pursuing the heart of their degree, the three young men fluctuated between excitement and anxiety. Yet their biggest concern wasn’t that they would perform poorly in their classes and labs or receive low grades. What sent the trio into a case of the doldrums was the worry that they would lose touch as their classes intensified in difficulty. John’s Aunt Prudence suggested an end-of-summer barbeque to lift the boys’ spirits, but her sassy cook, Lucia, responded with a more immediate remedy: cinnamon cake. Lucia knew the benefit of comfort food, and the cake she served the boys was rich and delicious enough to drown anyone’s sorrows. The following recipe is the one I had in mind when I wrote this scene. The flavor is reminiscent of pound cake, but this golden confection is lighter in body and smooth in texture. Be warned: it is rich beyond belief; however, most of the sweetness comes from the cinnamon streusel layer. 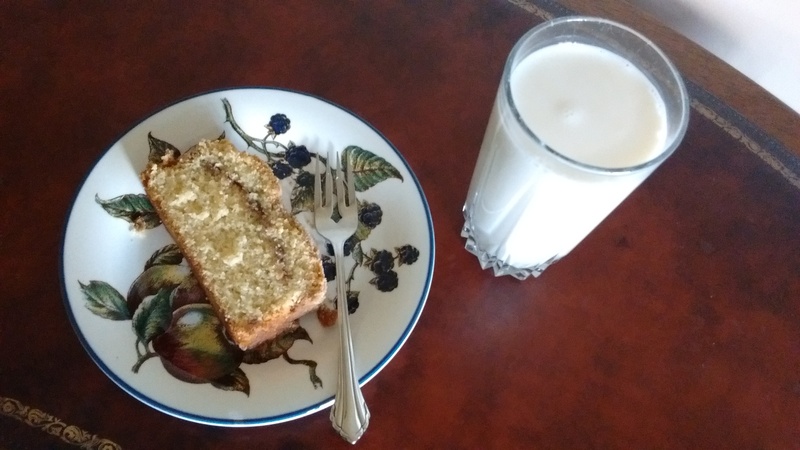 Enjoy a slice of Lucia’s cake with a cup of coffee or tea or a glass of milk. Mix the flour, brown sugar, cinnamon, and salt in a bowl. Work in the butter with the dry ingredients using your fingers or a pastry blender until coarse crumbles form. Set aside. Preheat oven to 350° and grease and flour a metal 9 x 5 x 3 inch baking pan. I strongly recommend using a stand mixer for this cake. The thick batter closely resembles dough and has the tendency to climb the beaters of a handheld mixer. Cream the softened butter and sugar. Add flour, baking powder, salt, egg yolks, vanilla, and milk. Mix on medium low speed until thoroughly combined, approximately 3 minutes. Spread 1/3 of the batter evenly in the baking pan. Top with half of the cinnamon mixture. Spread the remaining 2/3 of the batter in the pan and top with the rest of the cinnamon mixture. Bake on the center rack for 65 minutes or until a tester inserted in the middle comes out clean. Cool the cake until you can handle the pan before turning it out.